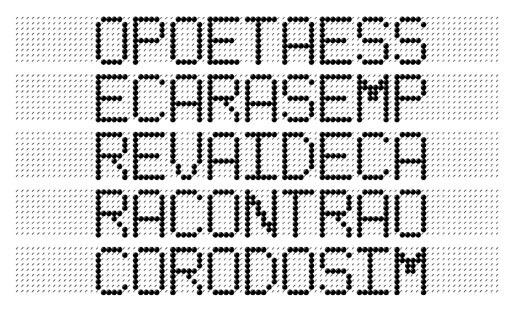 This kinetic visual poem by a pioneer in electronic literature was initially written in 1982 to be displayed in electronic signboards and video monitors.The more recent Flash version replicates the signboard nicely, allowing each word to fit in the screen as it scrolls from right to left, the conventional way such signboards deliver texts for ease of reading. Kac doesn’t want to make things easy, though, because the words don’t make sense when you read them, even if you know Portuguese. Here’s the complete text of the poem from Kac’s website. For a translation and complete decoding of the poem read pg 143 in Bohn’s Reading Visual Poetry. It is as thorough and revealing as you may want it to be and you’ll know exactly what it’s saying.But what’s the fun in that? If you’re up to the challenge, try manipulating the text a few ways (reading it out loud, typing it out, and playing with spacing— all in no particular order). As you puzzle over this enigmatic piece, keep in mind a few details about its designed display: this is a text designed to scroll horizontally over time, with spacing designed to only display one word at a time. Do we interpret this as line breaks? Each word contains exactly 9 letters, all represented in capital letters. Why? Was this a constraint in electronic tickers at the time? Or would using a combination of upper and lower case letters provide too much information that Kac didn’t want to reveal? Most importantly, as you manipulate the text, consider that the display medium is designed to present a text over time for readers to apprehend and retain in memory. If you really want to take on the challenge, try decoding it in your head. Of course, if you don’t know Portugese, this might be too much and you may want to go straight to Bohn’s analysis above. You’ll appreciate how this early kinetic piece takes a time-based electronic display medium previously used for information and advertising purposes, and subverts its utilitarian customary clarity by writing a poem that goes against the medium’s design.